The PWSA Library is a free service for members living in New Zealand. If you are not a member, please see our membership page for a range of free membership options. We stock small numbers of each book, so there is a limit of 3 items that can be borrowed at one time. Please use the library order form to request items and these will be issued to you for a period of one month, although they may be renewed, depending on demand. Returning books is easy as we will supply a postage paid envelope. Please scroll down to find the section you are looking for and click on the titles for details. 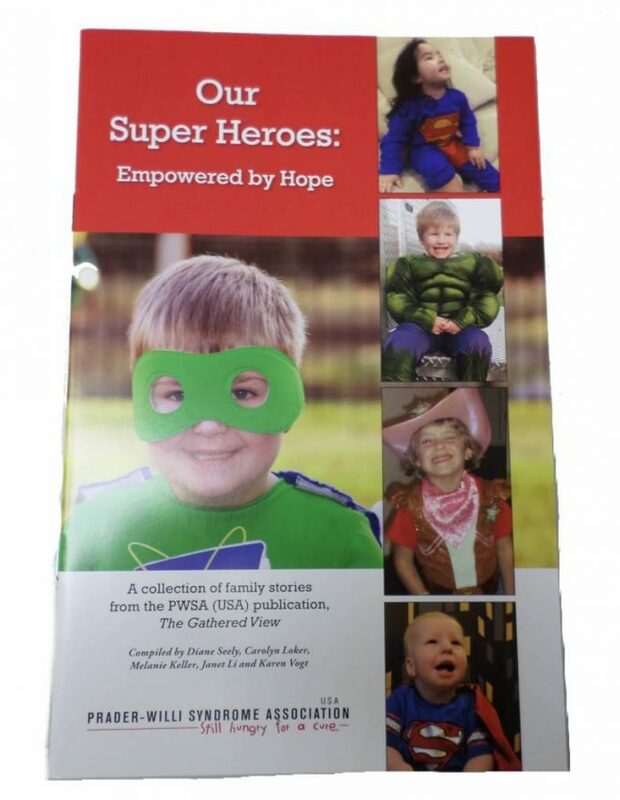 A collection of stories providing a positive uplift to those who have just received a diagnosis of PWS. These stories show there are many joys to having a child with PWS. The first stories were told in 2000 and some of those parents have provided an update for this revised edition. Each parent has an individual story to tell. A collection of family stories from the PWSA (USA) publications, The Gathered View. 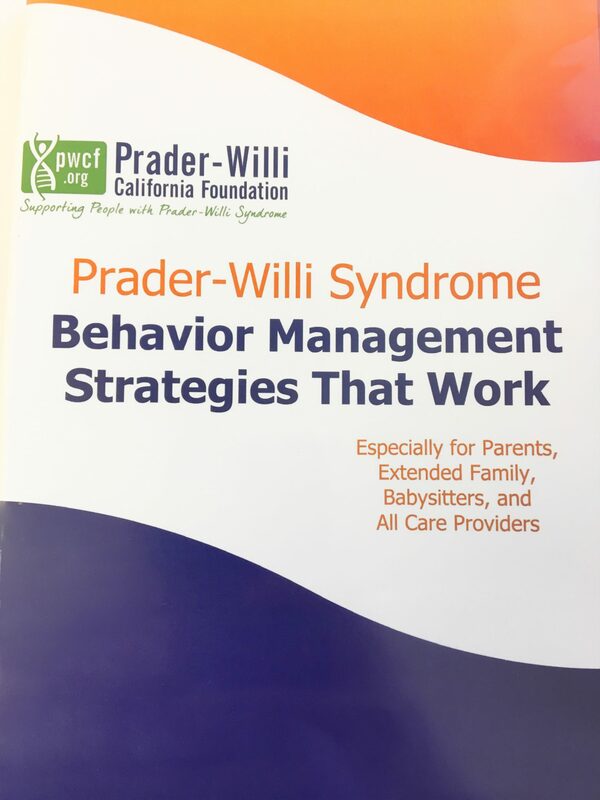 This booklet is intended to help families, early intervention workers and other care providers of children from birth to three with PWS. Contains: a parent’s perspective; key principles to help your child; information about pregnancy, birth and newborns; early intervention for 1 -6 months, therapeutic interventions for 6mths to 2 years and 2 to 3 years; information on brothers, sisters and family life; adapting to life and getting support. Brief Overview, Early Infancy, Helping your Child Develop, Babies and Toddlers, Language, Pre-School, School Years, Avoiding Obesity, Medical Help, Behaviour Management, Grandparents, Neighbours and the Rest of the World, Siblings, Remember your own Needs. 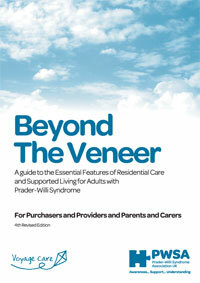 Basic information and guidance on how to manage the syndrome to provide the best start. 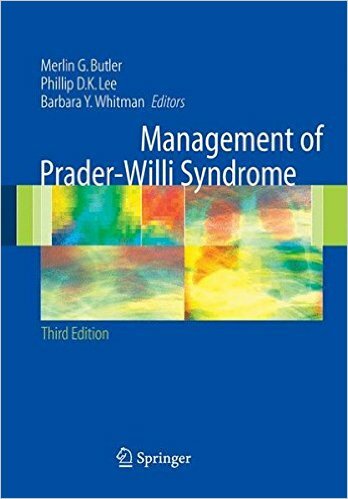 A useful starting point for professionals with little previous knowledge of PWS. Clearly written and produced in collaboration with health professionals. 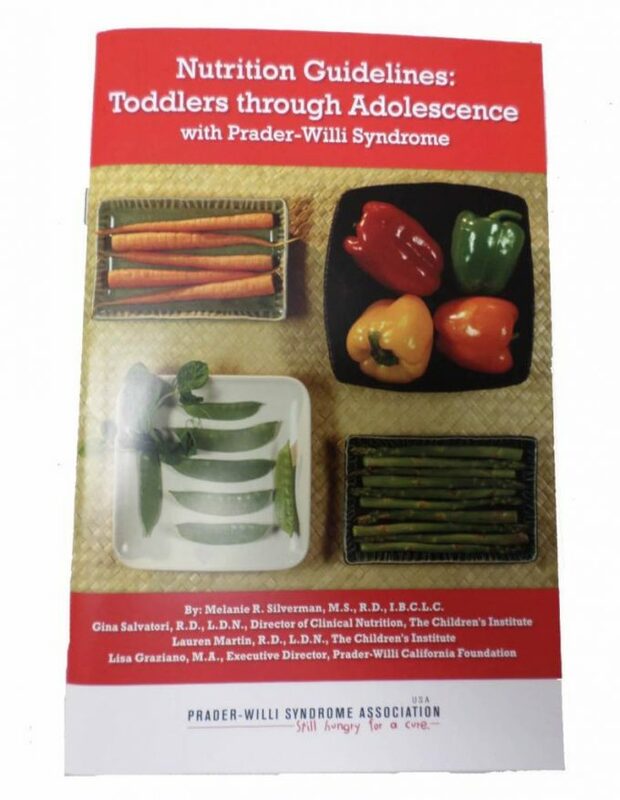 Includes: what is PWS; when a child is diagnosed; developmental & health issues; feeding babies & children; dietary management; helping your child reach their potential; learning abilities, school & education; family & social life. A compelling story and “Intervention Lifestyle” resource. 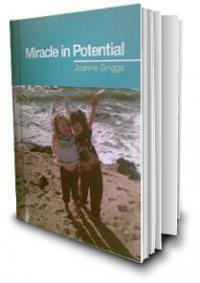 “This inspirational story outlines how Joanne and Adam Griggs created an Intervention Lifestyle program to overcome their daughter’s disability. 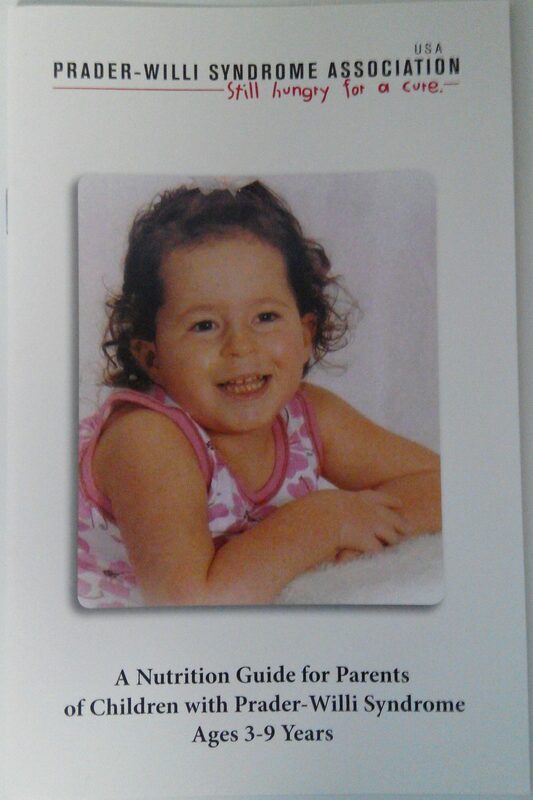 Mia was born with PWS. However, with the creation of the Multiple Initiative Approach (MIA) by the parents, Mia is now at school alongside her twin brother – a miracle in potential.” Joanne Griggs is the co-founder and president of the MIA Research foundation. General information about children’s physical therapy intervention: what is early intervention, physical therapy intervention for different age groups (infants, 1-3, 3-5, 6-12yrs, adolescents, adults), sensory integration, calming techniques, organising techniques, school and childcare strategies, sleeping strategies and sensory diets. By Kirsty Reid and Prof Peter SW Davies at the Children’s Nutrition Research Centre, University of Queensland, 2010. This resource is also available to download. A Guide for Parents and Carers. Peter Davies has a long term interest in PWS, being awarded the British Nutrition Society medal in 1991 for his work in the UK, evaluating body composition in children. He’s since published a number of international papers relating to energy metabolism and growth hormone treatment in the syndrome. Kirsty Reid, an exercise scientist and researcher, has worked in Australia and Canada and returned to the CNRC to continue her research. 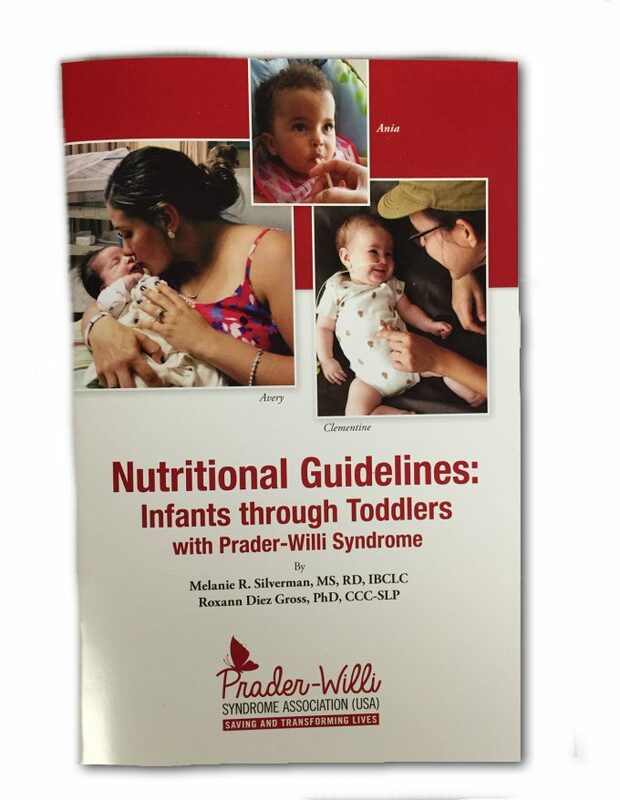 Provides answers to frequently asked questions about nutrition and feeding of infants and toddlers with Prader-Willi syndrome. By Melanie Silverman, MS, RD, Gina Salvatori, RD, LDN, Lauren Martin, RD, LDN, and Lisa Graziano, MA. Provides parents and caregivers with the basic nutrition knowledge they need to create the healthiest environment possible. By Karen H. Borgie, MA, RD, Sherry Gray, MPH, RD, Gina Salvatori, RD, LDN, and Lauren Marin, RD, LDN. Presents tools and guidelines for setting realistic weight goals and planning a nutrition care plan that can be easily followed for families, caregivers, and residential service providers. Explains why a person with PWS needs to keep to a lower calorie diet and some of the basic principles of good nutrition. Includes sections on managing the food environment, diet & exercise, nutrition, hints & tips, diet at different ages, meal planning & dietary considerations, e.g. diabetes. Part 2 contains a range of healthy, lower calorie recipes. Prof Peter SW Davies, Children’s Nutrition Research Centre, University of Queensland, Helen d’Emden and Brigid Knight at Mater Health Services, 2012. A Guide for Parents and Carers. 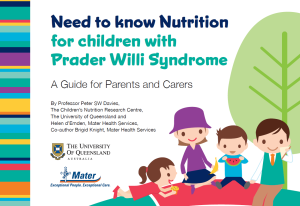 Information on many aspects of child nutrition in PWS, from offering treats, messages for grandparents and carers, different stages of PWS, to Growth Hormone treatment and risk of diabetes type 2. Provides diet case studies, tips on types of foods, managing food intake and ensuring adequate energy intake. A NZ made documentary screened on TV3, July 2008. 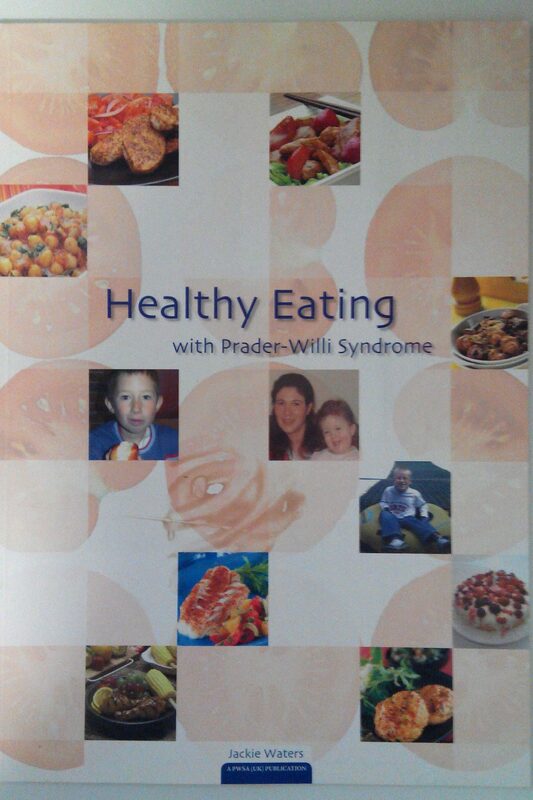 It follows a year in the lives of four people with PWS and observes their difficulties around food. 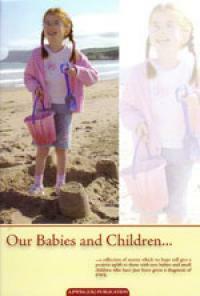 Contains 3 chapters: Newborn: birth to 4 months; Older Infants: 4-12 months; Toddlers: 1-3years. Covers topics such as feeding problems, growth, breastfeeding, tube feeding, nutrition and safety. NB. PWSA(USA) have replaced this book with the Nutritional Guidelines above. Karen H. Brogie, M.A., R.D. Consultants: Gail Overton M.S., L.N., Marion Taylor Baer Ph.D., R.D. First printed 1994. This is the fifth printing: revised and edited by Norma Terrazas R.D., L.D. Texas Children’s Hospital, 2010. Covers calorie needs, supplements, diet planning, food management, and explains food exchange lists. NB. PWSA(USA) have replaced this book with the Nutrition Guidelines above. Jackie Waters and Kendra Mitchell, PWSA(UK) 2005. Teenage years can be particularly difficult for people with PWS as they and their parents are faced with a sometimes bewildering array of changes and choices. 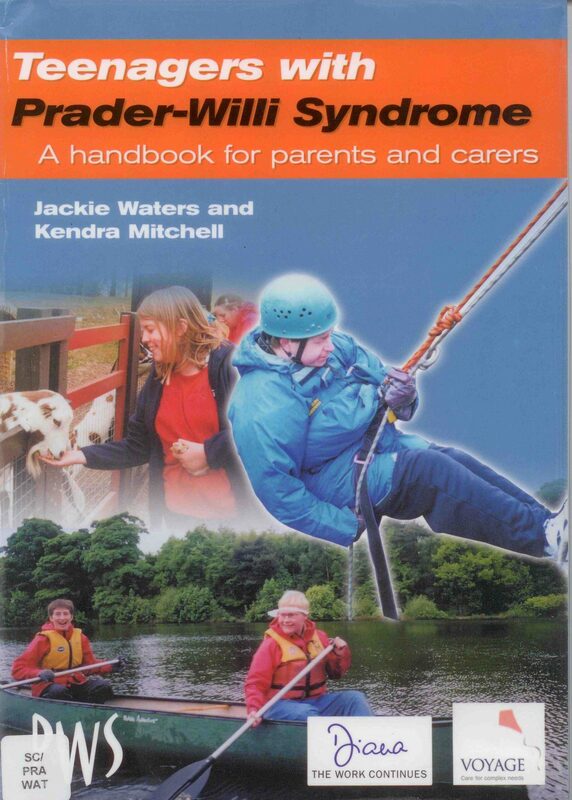 Includes: characteristics of PWS; ethical issues of control versus rights and responsibilities; dietary management; pyschological issues & behaviour management; social life & relationships; transition, further education, training & work placements; residential care & supported living. Aimed primarily at parents, but professionals will also find it a useful guide. Jackie Waters, PWSA(UK), 2009. Primarily for parents, but also useful for carers. Emphasis is placed on individuals with PWS sharing common traits, but also being very different. The needs of people with PWS within their adult status are addressed, but discusses difficulty reconciling these with high level of support and even control to ensure a healthy & fulfilling life. 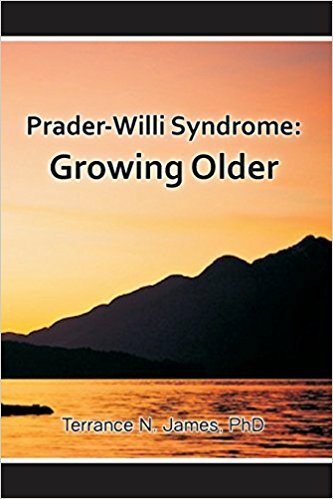 Written for parents and caregivers wanting a general overview of how a person with PWS may develop as an adult and written with a New Zealand parent’s eye view. Includes: Brief Overview of PWS, The Older Person with PWS (Adolescence, Sexual Development, Adulthood, Relationships), Food Management, Behaviour, Employment, Residential Options, Benefits & Assessments, Taking Care of Your Needs, Useful Contacts. Challenges readers to think about quality of life and the ageing process. It also documents the stories of Canadians with PWS who are over the age of 40, providing their perspectives on life and choices. Terrance James has worked with people who have PWS since the early 1980s as an educator and private practice rehabilitation consultant. 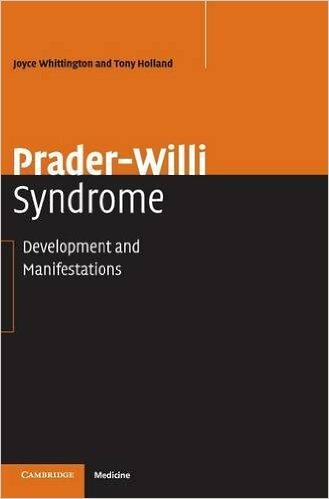 His PhD dissertation was on ‘Social and Psychological Aspects of Prader-Willi Syndrome’, 1987. PWSA(UK), Jackie Waters(Ed), 4th rev. 2012. The original version resulted from a 1996 workshop, attended by professionals with an interest in PWS. Now revised with suggestions and input from Prof Tony Holland, Dr Joyce Whittington, Margaret Gellatly (Dietary Adviser), David Palmer (New Directions PWS), Myles Kelly (Gretton Homes), John Booth (PWSA UK) and Kendra Rhodehouse (Outreach & Development Worker), amongst others. Jackie Waters (Ed), PWSA (UK), 2012. 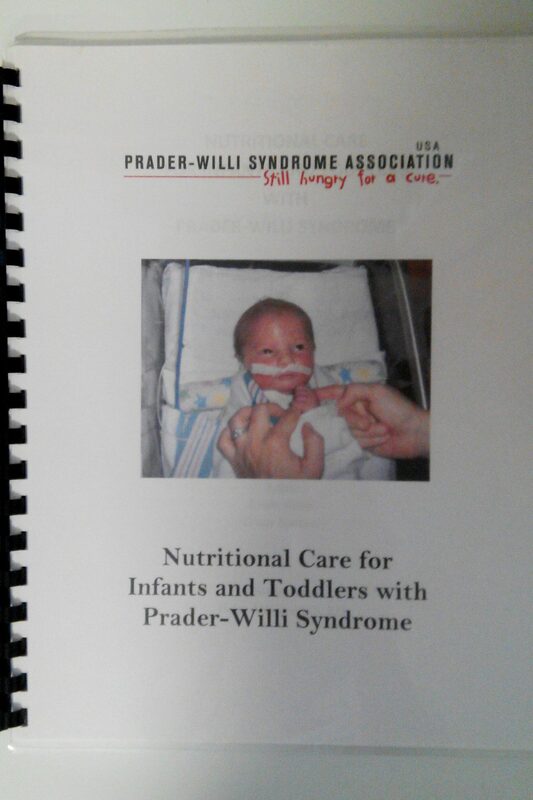 Written by people with PWS and especially for people with PWS. It explains what it’s like to live with PWS and how people with PWS and others can manage so that their lives can be positive and fulfilling. 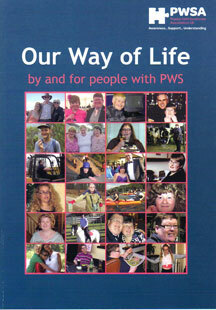 Contains real life stories and photos of people with PWS – all of whom are different, but all of whom share many of the same daily challenges. 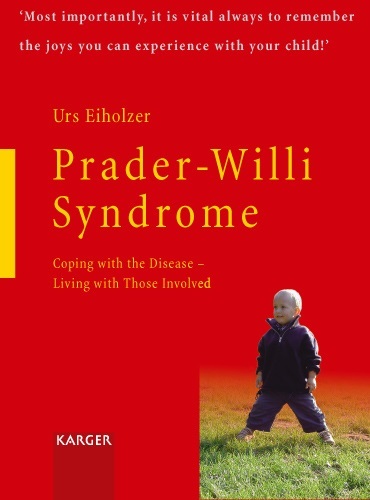 For many years, Urs Eiholzer has been engaged in the care of children with PWS and their families. He’s published a great number of scientific articles, contributions and supports a comprehensive, integrated treatment approach, taking into account both the biological & psychological aspects of the syndrome. 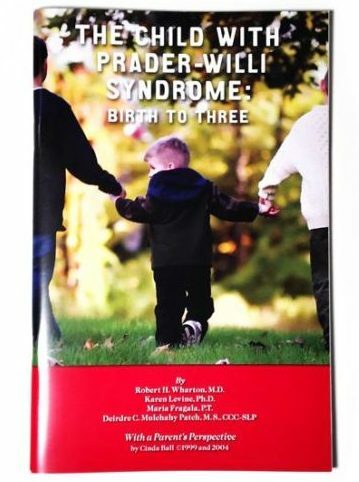 An easily understandable book specifically suited to non-professionals and presents the clinical picture of PWS, its genetic cause, latest research results and treatment options. Addresses not only the family members of the affected children, but also those who have contact with them – from the neighbour to the paediatrician. A recommended overview of the syndrome. 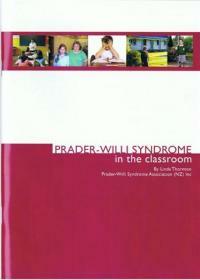 The only comprehensive textbook on PWS in print. Excellent reference tool for professionals and service providers. 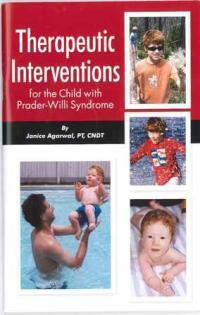 Written by professionals with considerable expertise in diagnosis and management of PWS. Clinical, social, family, and community issues are explored and management strategies identified. The text presents historical, medical, and genetic information to orient the reader. The major portion deals with pragmatic guidelines, rather than research and diagnosis, and is directed to health and educational specialists in academic, clinical, and community settings. Linda Gourash, MD and Janice Forster, MD of The Pittsburgh Partnership. 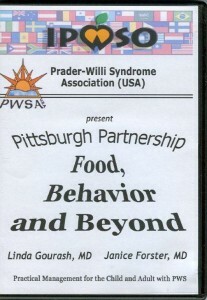 Produced by IPWSO and PWSA USA, 2008. 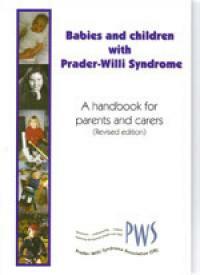 Provides practical management tips for the child or adult with PWS. Includes the following presentations: Nutritional Basics, Food and Behaviour, The Behaviour Toolbox, Cognitive and Behavioural Traits, To Medicate or Not to Medicate. 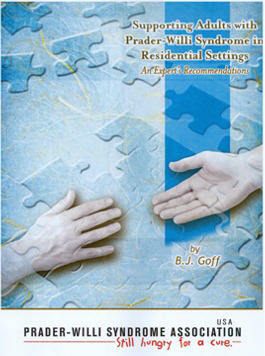 An essential teaching tool for provider agencies and an excellent learning tool for parents. Linda Gourash is a developmental paediatrician with extensive clinical experience in caring for children and adults in medical and behavioural crises related to PWS. Janice Forster, MD, is a child and adolescent neuropsychiatrist with many years experience managing hospitalised persons with complications of PWS. Joyce Whittington, Anthony Holland, 2004. PWS is associated with an assortment of physical, behavioral and cognitive abnormalities that create a broad range of interdisciplinary care needs. 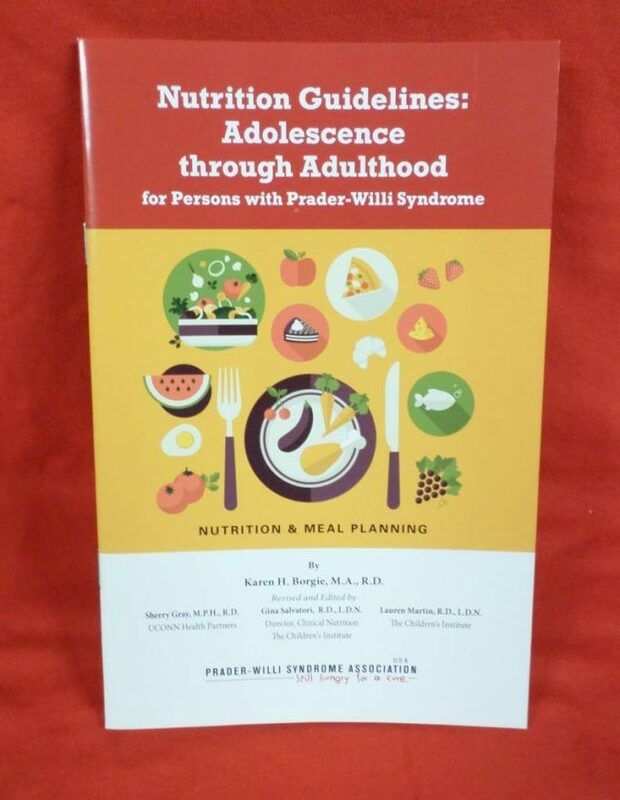 The authors identify and integrate the latest findings on managing the complex medical, nutritional, psychological, educational, social and therapeutic needs of people with PWS. Both have been involved in the Cambridge PWS study–the largest of the cohort studies of PWS–which provides the basis of this book. Part of a series ‘Congenital Disorders – Laboratory and Clinical Research’, this is a collection of research edited by Charlotte Hoybye (Assoc Prof, Dept of Endocrinology, Metabolism and Diabetology, Karolinska University Hospital.) As a reference style resource, we only stock 1 copy but copies have been gifted to the 2 New Zealand Medical Schools. Contains contributions from: Martin Ritzen, Merlin Butler, Suzanne Cassidy, Jennifer Miller, Maithe Tauber and Berthold Hauffa, Harriette Rosen Mogul, Joyce Whittington and Anthony Holland, A. Gontard, M. Equit and Leopold Curfs, Graziano Grugni, Glenn Barell, Karen Balko and Alexander Viardot, , N.E. Bakker and A.C.S. Hokken-Koelega, Charlotte Hoybye and Jens Christiansen, Harry Hirsch, Talia Eldar-Geva and Varda Gross-Tsur, Stense farholt, Maria Nijhuis-van der Sanden, Linda Reus and Georgina Loughnan, Barbara Whitman, Annick Vogels and Elly Scheermeyer, Borge Troelsen, Susanne Blichfeldt, Giorgio Fornasier, Jean Phillips-Martinsson. NB. NOT SPECIFIC TO PWS. 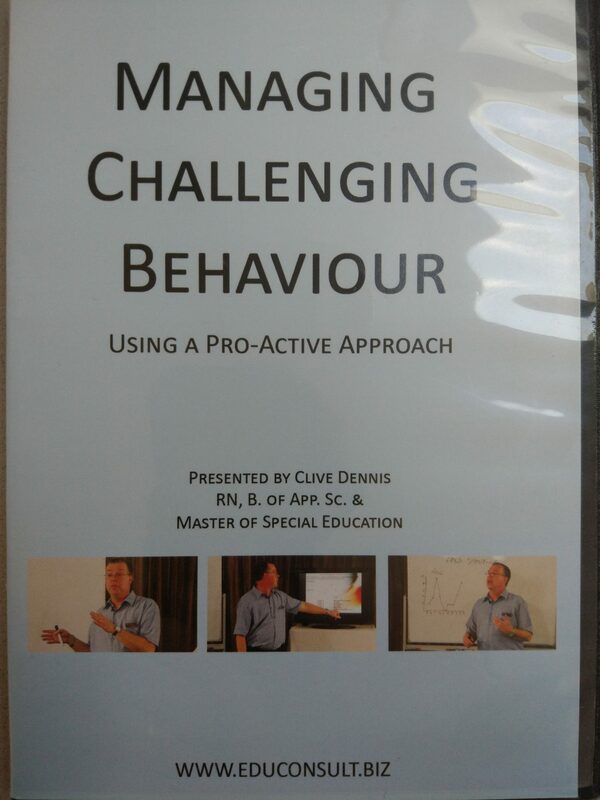 Clive is an internationally recognised speaker in the area of Behaviour Management. Over 40,000 people have attended this workshop. This DVD provides a variety of options to prevent and/or reduce the possibility of challenging behaviour occurring. Discuss how to have a proactive rather than reactive approach and how to empower the individual to be more responsible for their own behaviour. Parents of the toddler or young child will learn how to create a foundation that encourages cooperative interactions throughout the lifetime. Parents and care providers of the older child, teen, or adult will learn strategies that can improve the flow of the day and everyone’s overall quality of life. No matter what your relationship with the individual with PWS the information provided in this DVD will be immediately beneficial. Created by Michelle Donaldson and Ruby Gold, 2006. 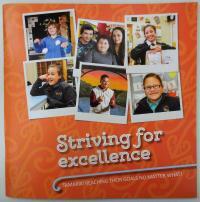 Written for teachers, as well as giving guidelines for parents and carers. Includes an overview of PWS, behaviour management, teaching strategies, managing the environment, working with challenging behaviour and anger outbursts, services and support, transition, the future, and employment. Tamariki reaching their goals no matter what! This book features a short story about one of our NZ families. Janice Forster (Ed), Pub. Hubert Soyer & Norbert Hodebeck Stuntebeck for IPWSO, 2010. 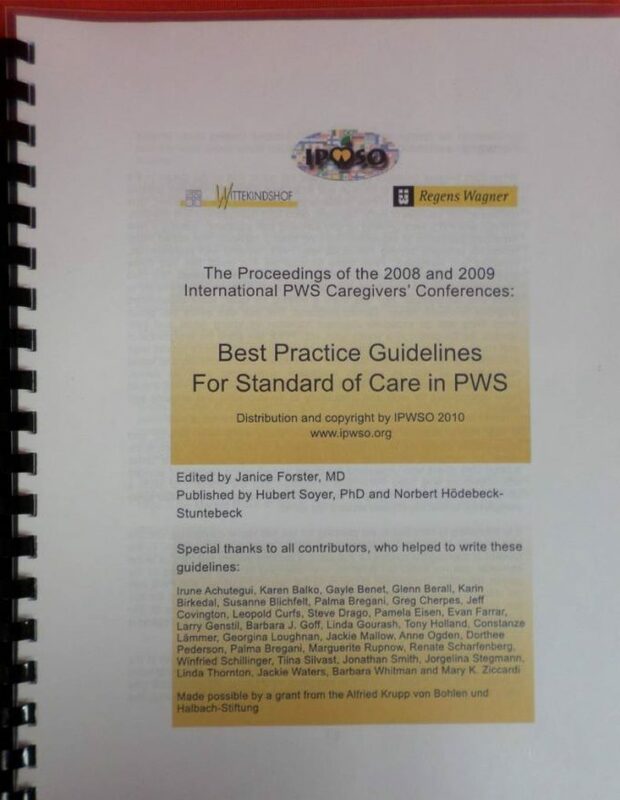 The proceedings of the 2008 and 2009 International PWS Caregivers’ Conferences. As a reference style resource for those planning services, we only stock 1 copy. It contains over 200 pages of presentations, abstracts and guidelines for presenting standards of care in over 80 nations. A breakthrough guide for service managers, teachers and health care providers. 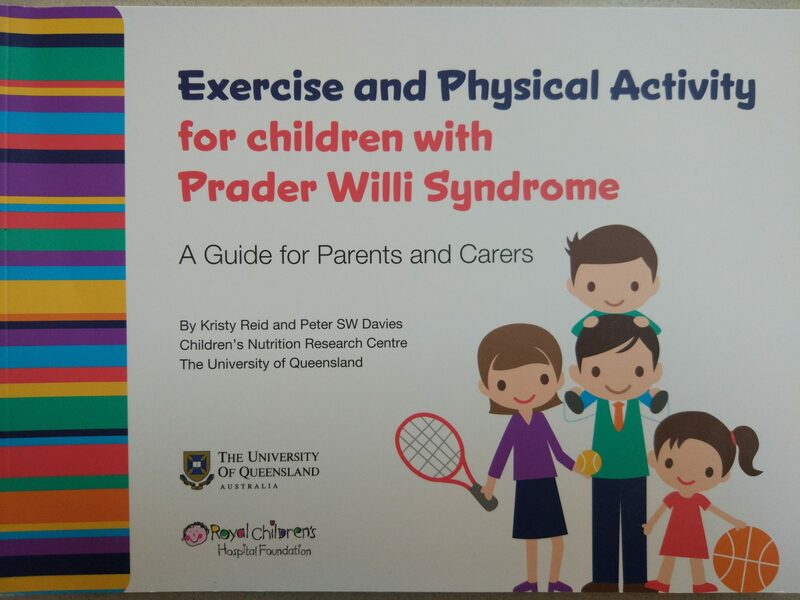 Features guidelines and models developed for use across all environments where people are caring for individuals with PWS. 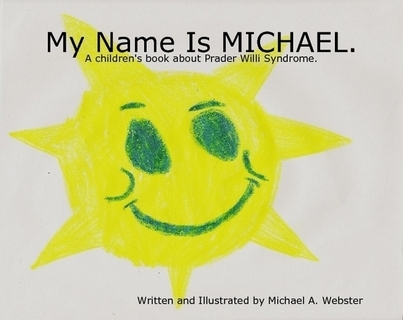 A book written by a child with Prader-Willi Syndrome to help other children understand more about this rare disorder from a child’s point of view. 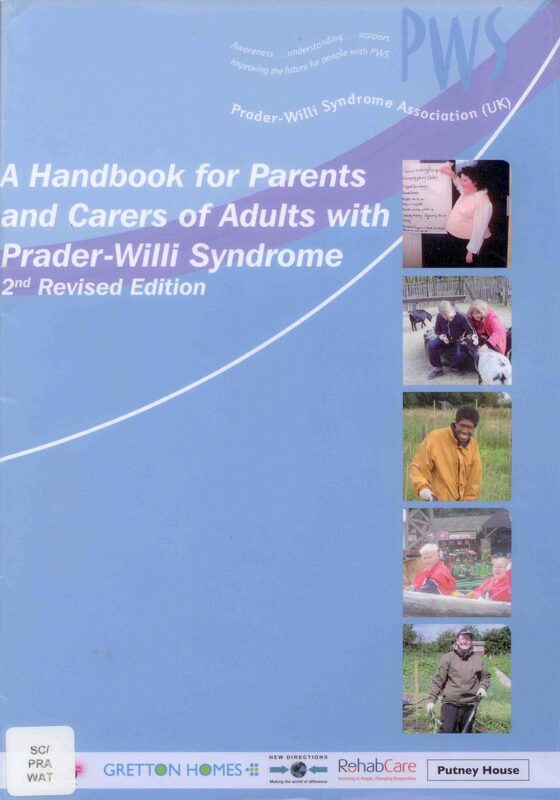 A brief overview covering some aspects of living with PWS – suitable for a younger audience / younger readers. 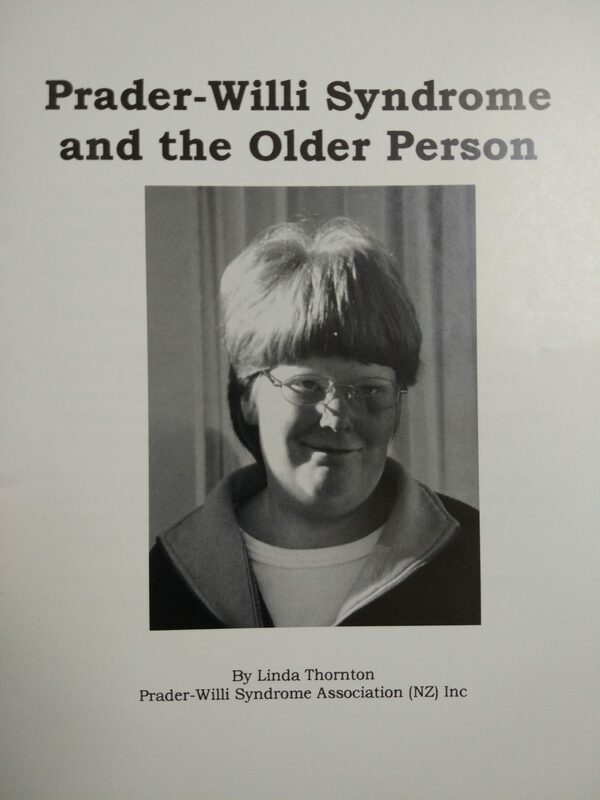 A story of two children with Prader-Willi syndrome (10 and 6) moving through the school day, explaining their difficulties and achievements, whilst highlighting that they are like their classmates. In one scene, Michael is so frightened by a thunderstorm that he disrupts his class and won’t stop talking about the storm. Valerie’s account of that day is retold, showing how she located a book on thunderstorms and started to read. That did the trick. The story was so compelling that Michael asked to take the book home that evening. The book concludes with notes on PWS for the professional and a PWS simulation lesson plan for teachers. Suitable for all school-aged children, particularly 6-13yrs. There are many reasons why children may be unable to eat every time they are hungry. 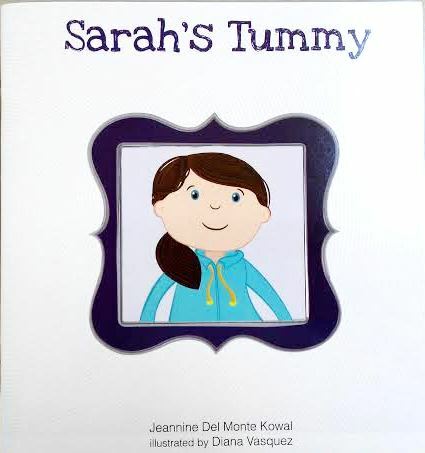 This book teaches them that eating nutritious food in quantities that their bodies need is more important and better for them than always eating what they want. Written and produced by a PWS mum and kindly shared with the global PWS community. Not PWS specific, this is a triumphant story of a boy’s journey initiating a restrictive diet so he can be like other children – happy and healthy. 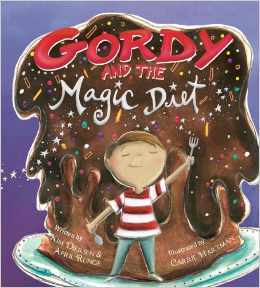 Gordy thinks he has a monster living inside him which symbolises the negative behavioural, physical, and emotional reactions he experiences in response to certain foods, so Gordy starts a special diet – a “Magic” diet – in hopes of quieting his monster. He learns to have willpower as he chooses foods that help him feel great. Parallels can be drawn between diets which restrict foods to prevent negative reactions and the PWS diet which restricts calorific intake to prevent rapid weight gain and promote good health. Written by a Kiwi mum, this is the story of a little boy named Brody who starts at a new school. Brody has special needs and this story tells how his classmates come to realise that it’s ok to be different! 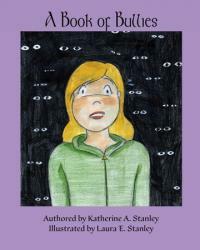 This book puts the spotlight on the hurt and harm caused by bullying. Katherine has PWS and is a self-proclaimed expert on bullies. She hopes this book will encourage people to be kinder to each other and will convince other children with special needs to never give up on themselves. Humorous, uplifting, and engaging, featuring a whole cast of bully characters – the Tough Guy Bully, Comedian Bully, Cool Girl Bully, Gossip Bully and more – brought to life through rhyming verse and illustrations. Watch Katherine’s video about her book. 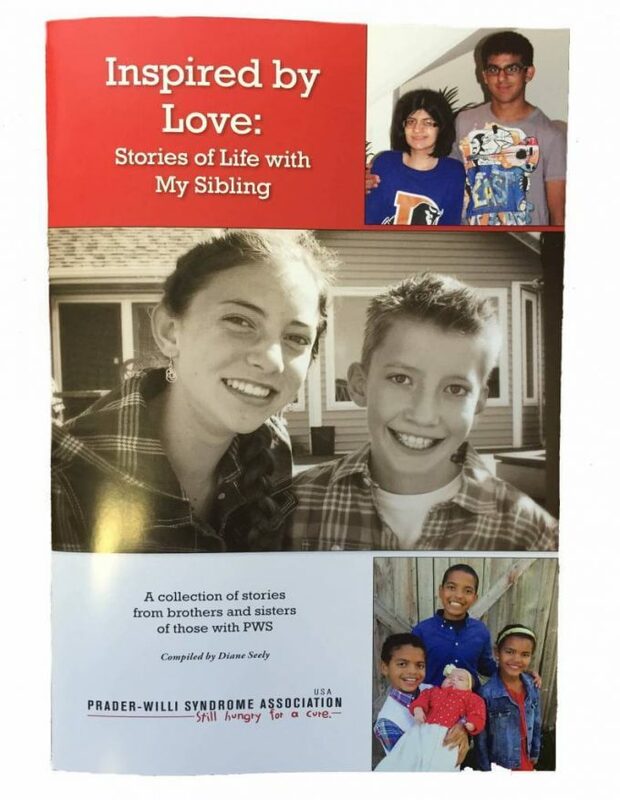 A sibling’s story about living with a brother with Prader-Willi Syndrome. 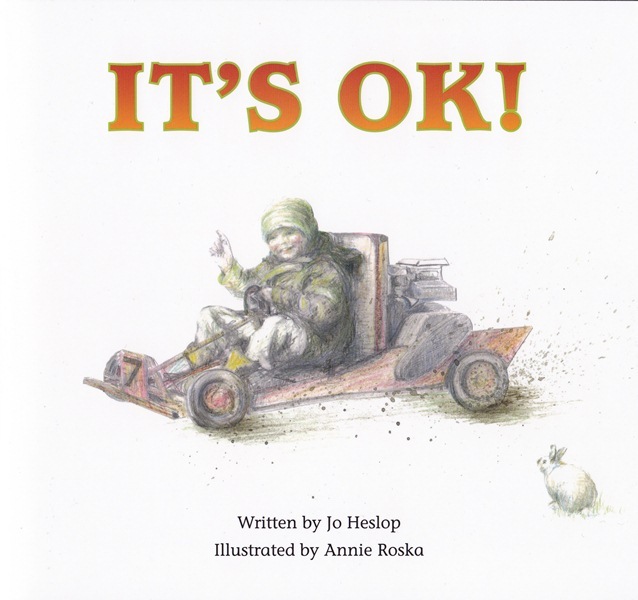 Suitable for junior to intermediate readers, this book recognises the range of feelings that arise in having a brother or sister with PWS. 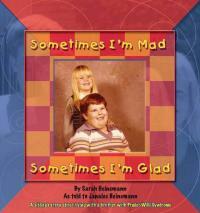 A collection of true stories written by siblings who have a brother or sister with Prader-Willi syndrome. A book about siblings, for siblings. 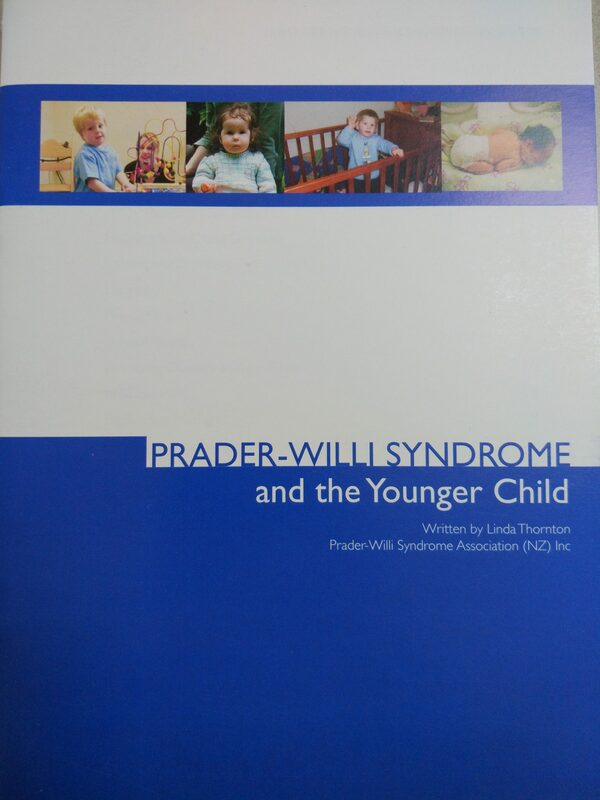 More suitable for older siblings / readers, it contains survey accounts which include details on the effects of having a sibling with PWS – the benefits, negatives, hardest parts and some advice for others. 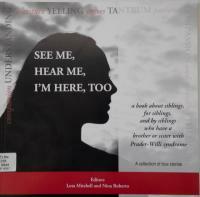 It also contains a collection of essays by some of the siblings about their siblings with PWS. The book concludes with a brief section of advice for parents. 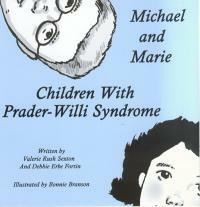 A collection of stories from brothers and sisters of those with Prader-Willi syndrome.